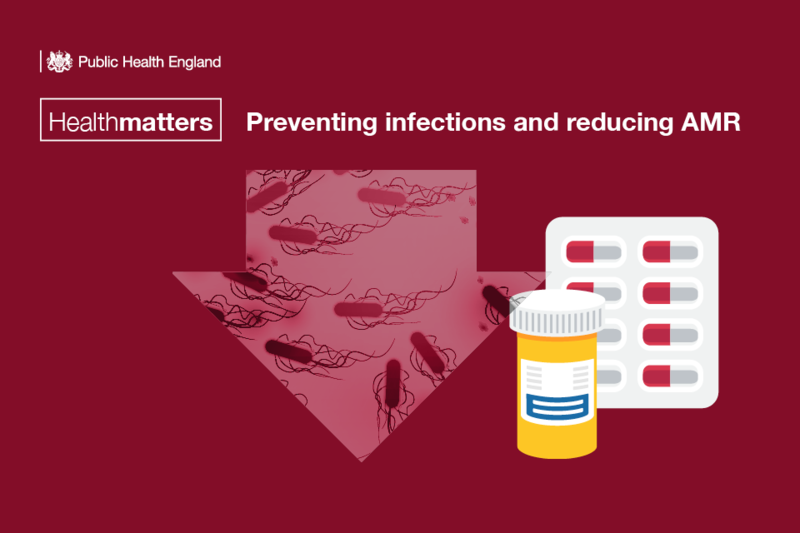 We hope our latest edition of Health Matters – on the subject of “Preventing infections and reducing AMR”– will help you and other health professionals by compiling key facts, figures and evidence of effective interventions. This professional resource outlines the importance of infection prevention and control and how it can contribute to reducing antimicrobial resistance (AMR). Where we can, we’re also committed to answering your questions and taking on your feedback. In this blog we’ve published the answers to a number of Health Matters questions we received from professionals across the UK at the recent launch teleconference. We’d love to hear from you at healthmatters@phe.gov.uk. My question is around about the calculation of the all-cause mortality. This is something we’ve been struggling with for a little while in terms of knowing over what period is best to take the data to calculate that all-cause mortality. We’ve had a look in the various bits of national guidance, and there doesn’t seem to be anything clear in there about the best time period to use. The bit we’re struggling with is do you just look back and calculate it every 30 days? Do you look back at a rolling three-month rate, a rolling six month rate, a rolling 12-month rate? At Public Health England, when we look at all-cause mortality, we take 30 days as our period; 30 days from the onset of the bloodstream infection. We do that because the relationship between mortality and the infection is going to be highest in that period. It doesn’t mean that there aren’t other cases that may be attributable to the mortality that happens outside those 30 days, but it does mean that this is when most expected deaths will take place. We calculate the 30-day mortality once a year on the annual dataset for each financial year. Obviously, if you want to do it is as a rolling measure, we would suggest that a rolling 12-month rate in an organisation would be an appropriate way to go. It would allow you enough cases to detect over a reasonable period of time. I am involved with the actuarial industry and I’m involved with the working party that is trying to model future mortality and morbidity as a consequence of antimicrobial resistance. One of the questions I have relates to actual cause of death in terms of those who have a resistant infection. Is there anywhere we can go to, or do you yourselves take a record of cause of death as a specific consequence of a resistant infection, and is there a move to enforce more strict details on cause on the death certificate? We know that the specific data on cause of death is really poor. As you may be aware, the Office for National Statistics is just starting to introduce a new medical examiner approach for organisations. This will look in detail at the cause of death, and try to understand more details about the cause of death and the contributing factors. That would be really helpful to standardise the cause of death recording and also allow us to understand more on the organism-specific data. We find that what you see on the cause of death is often a syndrome that is the cause of death rather than the particular bacterium. What is the primary source of E. coli blood stream infections? Where are they occurring and are mainly from urinary infections? By far the most common source is urinary infections, and of course those urinary infections often arise in community settings, but not always. Even when they’ve arisen in community settings, individuals have often had a healthcare contact in the period before their urinary tract infection arises. One of the key elements of the approach that we are putting forward here is about really rigorous, robust assessment, diagnosis and management of urinary symptoms in community settings. I’m a consultant microbiologist and community infection control doctor and we’ve been grappling with E. coli bacteraemias and looking at risk factors for a period of time, and recognise the importance of getting it right. We need to have a cross-healthcare and social care approach, which I would favour but I was slightly concerned that at the same time we’re referring to healthcare-associated E. coli bloodstream infections. In our experience, over half the patients have not had previous healthcare contact, and that may actually be the issue. We may not recognise that if we’re not careful. I think we need to be pushing the working across the system. We’ve done that locally and we’ve got a hydration campaign and we’re sharing our stewardship agenda across our area, and I think that’s where we should be concentrating our efforts. Your point is very well made. Part of what we’re trying to do is to identify an achievable ambition to start off with that will help to focus people on the issues that you need to tackle to reduce the risk of Gram-negative bloodstream infections. Being able to start off with those that we can define as healthcare‑associated, at least gets us to a starting point with this. But that in no way diminishes the fact that many of those cases are not associated with healthcare in the first place. If we can tackle the healthcare issues, then I think it also helps us to get into some of the wider issues around prevention of urinary tract infection. What we are trying very hard to do is to avoid a situation where we put incentives in place to have a lot of debate about whether it’s the hospital’s fault or the community’s fault - instead of how do we act in order to reduce risk and prevent onset of infection? When we do look at those infections that arise in the community, the number of cases where there has been a healthcare intervention of some kind in the few weeks beforehand is actually really quite high, so in some cases people are becoming ill because there is a gap in health care as well. But unless we’ve reviewed the patient, we won’t identify whether a person has been ill because there is a lack of a service. Building on the idea of breaking the chain of infection, I feel that we need also to develop intelligence as to where, from an environmental perspective, infections can be exposed to individuals, or where they are exposed to bacteria that can lead to the chain of events that you described. In what you’re looking at, are there any moves towards getting that intelligence as to where people that present themselves in the early stages of an infection may have developed that initial exposure? The European-wide JIACRA report, which combines data from humans and animals, antibiotics and resistance data, shows quite convincingly, across Europe at least, that the resistance that we see in humans in bacterial terms, especially in E. coli, is associated more with antibiotic use in humans than with antibiotic use in animals. Obviously, that’s different for other Gram-negative things like Campylobacter, which is more of a direct zoonotic transfer, that is, transmitted from animals to people, and therefore our focus is very much been looking at the risk factors in humans. We know, for example, that 10% of people with E. coli blood stream infections are in care homes. We know for example that 25% of residents have a urinary catheter in. We know that more than a third of them have had an antibiotic in the previous four weeks. So trying to pick the low-hanging fruit is our first priority. And then we can go and look in more detail. We do have data at PHE on patients on whether they’ve had a preceding urinary tract infection, and we’re doing some work looking at how that previous urinary tract infection may relate to their current bloodstream infection. For many of the other sources of infection, there is not any good, clear data that is available either at a patient level or indeed nationally. We look for specific connections, but on the basis that our work on preventing antimicrobial resistant is part of our work to reduce the burden of infectious diseases as a whole, there is a generic issue about reducing rates of infection, prevention measures, and breaking the chains of infection. So, even if we cannot demonstrate the link for a specific infection with specific environmental exposures, the principle of good hygiene when it comes to environmental exposures and preventive measures is equally important nonetheless. We provide support for people with mental health and learning disabilities in community settings as well as residential. How do we get message out about breaking the chain of infection to people with a learning disability and other vulnerable groups? How do we get that engagement out into the community, maybe to our regulator, CQC, maybe working with local councils,. Are there any next steps or strategies to get that engagement? NHSI and PHE have been working with the CQC, looking at the inspection regimes for all of the pillars that they inspect against, because it is much, much broader, as you rightly say, than just the acute providers. We have been providing training and have asked them to focus on the question of infection prevention and how to manage that wherever they go. We work on behalf of a local authority and are wondering if there is an expectation that we actually investigate post infection reviews (PIR) on all our patients with E. coli blood stream infections? And if this is so, will there be any extra resources available for this? Because I’m very much aware that it’s important that we don’t take our eye off the ball with C. difficile and MRSA, and we are obviously continuing to do that. The driver for the improvement in the first couple of years is through the quality premium, via NHS England, so there is an expectation that cases will be reviewed as part of that process. And unless we do review all our cases, we won’t get the learning. But it’s important that it isn’t just always done by one person, but is reviewed by a multi-disciplinary cross system group around the table. Some areas have done some really good work around gathering the information, and the way they’ve done that is to have a cross- system group, and in that cross-system group, they share the information with each other. The PIR process was a very lengthy process, and we understood that this would not be possible with the number of cases of E.coli BSI that we have. We have developed a two-page, very quick risk factor data analysis, which is really looking at things like in the case of a UTI, was a urinary catheter present or manipulated? Did they get treatment? Was that treatment appropriate? So very much focusing on what you think the source of the infection is, what you think could have been done differently, or what with the risk factors for that sort of infection. At the Royal Free hospital they’ve done a look back over the last 150 cases that have occurred. It does take time, but it also gives intelligence to know where to start interventions. But it’s not a formal PIR process; it’s a risk factor analysis, looking to where to identify risks that you can actually intervene and change. The difficulty is that unless we get good information on the risk factors, we’re not going to be able to tailor the advice and monitoring to be able to get that 150 number down so that then we’ve got far less pressure for both care treatment and information gathering. It’s one of those difficulties where an investment of that time and resource now will really help us to make the difference to get the numbers down in due course. But we absolutely understand the difficulty of the pressures that that brings. Hello, I’m the lead infection control nurse at Chesterfield Royal Hospital and we’ve been doing quite a lot of work on this over a number of years. We have had a Commissioning for Quality and Innovation (CQUIN) project to reduce the rate of catheter associated urinary tract infections (CAUTI). In particular, 50% of our E. coli bacteraemias were predominantly catheter-associated, and we actually successfully reduced our CAUTIs. Interestingly though for us, the highest focus for an E. coli bacteraemias was a urinary tract infection, but not catheter- associated, and we’ve also locally identified the link to poor continence management. So, we have got a whole health economy group that is working across four CCGs and two acute trusts and that collaboration has, I can confirm, sort of equalised the workload, and working together, we’re helping to identify and focus appropriate referrals, and also working quite heavily on hydration as well. Thank you, it sounds as if there’s a lot that we can learn from you on that. We have featured Chesterfield Royal Hospital’s work in reducing the rate of catheter associated urinary tract infections as a case study in this edition of Health Matters. Is there potentially a greater role for point of care diagnostic tests? I’m thinking specifically in terms of the amount of antibiotics prescribed in primary care versus the hospital setting, and the resources available to GPs in terms of making a decision whether to prescribe an antibiotic or not? NICE guidance on antimicrobial stewardship and also the NICE guidance on pneumonia both recommend looking at C-reactive protein as a point of care test for GPs. There are a number of pilots happening across the country, looking at how to implement this, some with good success with good randomised control evidence to support it. Bath and North East Somerset have also done some good work looking at ‘to dip or not to dip’, showing that providing dipsticks in the elderly reduces the amount of antibiotics that are given, providing antibiotics only when they meet the clinical syndrome. Too many points of care tests can actually increase antibiotic use, unless you carefully select your population. But in conditions like pneumonia, there is good evidence for point of care testing. What are we doing now to increase the understanding of AMR in our next generation of health care professionals, and should we get more involved in the education process? In July, Health Education England published the full report of its assessment of antimicrobial prescribing and stewardship competencies in undergraduate health courses. It included information about some of the resources available to support learning, and what gaps in provision need to be filled. From those who responded, 67% of Health Education institutions have reported implementation of all antimicrobial prescribing and stewardship competencies. In November 2016, all chief professional officers wrote to Deans of all healthcare schools to recommend that antimicrobial resistance and stewardship is included in undergraduate and postgraduate curricula, and CPD courses alongside infection prevention and control which is already well embedded within curricula. Developing a digital award badge. The earned digital badge that can be added to their LinkedIn accounts on completion of a number of tasks including a short e-learning AMR module developed by Health Education England. The first national student AMR conference in November 2017. For World Antibiotic Awareness Week 2016, there was registration for AMR Awareness activities from 30 Universities. Thirty-three health student societies nominated 100 AG representatives. If you have any further questions, the antimicrobial resistance team here at Public Health England will be pleased to answer them. So please send your question by email to healthmatters@phe.gov.uk . Do please keep on sharing your stories about how you have used the Health Matters materials to communicate your messages and to get things done, or if you have ideas for improvements. Just send an email to healthmatters@phe.gov.uk. Health Matters is a resource for professionals which brings together the latest data and evidence, makes the case for effective public health interventions and highlights tools and resources that can facilitate local or national action. Visit the Health Matters collection page on GOV.UK or sign up to receive the latest updates through our e-bulletin. If you found this blog helpful, please view other Health Matters blogs.